Salted Caramel added to coffee cakes makes this brunch recipe the main attraction. Pecan, cinnamon, brown sugar filling layered between a buttery moist cake. 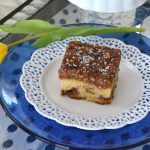 a caramel topping is broiled on the top of coffee cake after baking and sprinkled with sea salt. 1-cup sour cream or Greek yogurt. Grease and flour 9 x 13-inch baking dish. Preheat oven to 350 degrees. Cream sugar and butter in large bowl. Add eggs and extract. Combine flour, soda and baking powder in separate bowl. Alternately add flour mixture and sour cream to butter mixture. Beat until fluffy. Prepare filling: combine ingredients for filling, set aside. Pour half the batter into prepared pan, sprinkle with filling, add remaining batter. Bake at 350 for 35-40 minutes or until cake center is done. Meanwhile in saucepan, combine all ingredients for topping. Stir to combine. Remove coffee cake from oven and pour caramel topping on top of warm cake. Broil cake, watching to make sure topping doesn’t burn, for 2 minutes until topping begins to bubble. Add course sea salt as the garnish. Let cake cool completely before slicing and serving. Cut into squares and place on decorative plate or platter.